Experience astonishing, unique and delicious Mexico City! Mexico is one of the greatest food hotspots in the world. It's the country that’s gifted the world with chocolate, vanilla, corn, avocados, tomatoes, chili peppers many other delicious and essential foods. While all Mexican foods are found worldwide, we believe the most delicious and authentic expressions are found in their country of origin. And all regional Mexico foods, which differ greatly from one another, are available in the nation's capital. Eating in Mexico City is like eating everywhere in Mexico. 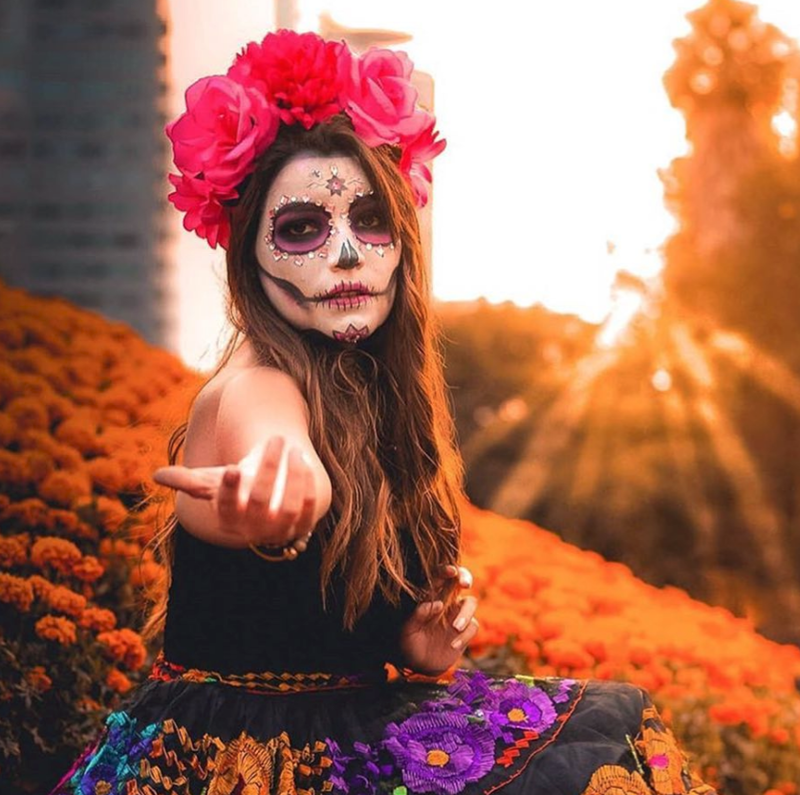 Mexico is the land of tacos, Frida Kahlo and mariachi. Mexico City was the capital of both the Aztec and Spanish empires and today is home to the world's highest concentration of metropolitan museums. During our Mexico City Experience, we'll dine at Mexico's best and most famous restaurants. 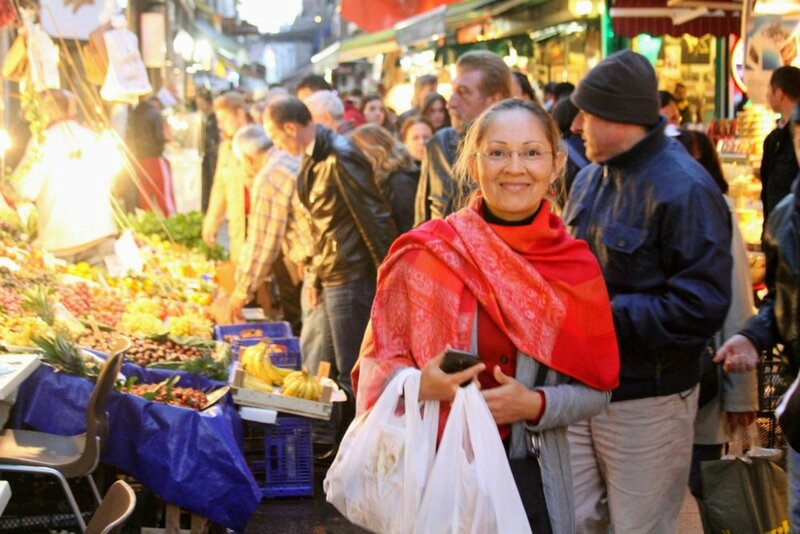 We'll visit the city's top markets and food producers. We'll taste mezcal, tequila, pulque and sample the country's emerging wines. We'll picnic on boats, floating through otherworldly Aztec canals. We'll ring in the new year with a spectacular New Year's Eve party in a true Mexican style fiesta. And lots of secret surprises! We'll take professional-quality photos of the whole experience for you to keep and share, so you can focus on having the time of your life. Here's how the whole thing works. We'll pick you up from the Mexico City airport. Our small group will stay together in a wonderful spot in a cool neighborhood in the city. And We'll drop you back off at the airport at the end. Everything (except your airfare) is included -- food, lodging, transportation and activities -- in the price. The Mexico City Experience takes place December 28, 2018, through January 2, 2019! We still have two spots left!! Go here to grab your spot today! Come celebrate with us in astonishing, unique and delicious Mexico City! Should I get the Hitler wine or the Stalin wine? I’m dining at a very nice local trattoria in Italy near the Dolomites and I’m somewhat disturbed/amused by a particular wine shelf. The Prosecco Experience starts in just one week! I’m sooo excited! It’s going to be epic! Hooray! And thank you to all who did and will sign up and join us on one of our adventures next year. Special thanks to those of you who have sign up for two or three Experiences! Thank you for appreciating what we do and for continuing to believe in us. Next week’s Prosecco Experience is actually the first Gastronomad Experience we’re hosting for a second time, and it’s a great feeling! And, of course, it’s going to be different than the first one! Each Experience is unique! For example: We'll host the amazing and talented food writer, photographer and cookbook author, Valeria Necchio, who will join us for The Prosecco Experience next week! A local Venetian who’s currently spending time in Piemonte, Valeria will join our small group for a day of cooking and chatting. She’ll talk about her book, her life growing up in a multi-generational Venetian family, and she’ll even teach us about food photography! We’ll conclude the day with a magical long table dinner gathering by the fire! Veneto, Valeria’s beautiful cookbook, will be the inspiration for a day of handcrafted food from the book’s recipes, including her delicious handmade pumpkin gnocchi with sage butter and walnuts! She also has expertise in Gastronomic Sciences and History so we’ll get to do some deep learning about Venetian cuisine and the Veneto region in general. Her book is more than just a cookbook -- it's a beautiful composition of family recipes, food anecdotes and wonderful storytelling through food inspired by her own upbringing and her family traditions in the Venetian countryside. I’m so incredibly happy to have Valeria join us for a day of authentic Venetian revelry with food, wine and a dinner gathering to remember for the rest of our lives! The Gastronomad Experiences are about learning, connecting, appreciating and enjoying life in the most profound way through meaningful and fulfilling gatherings with inspiring people in the world most beautiful places! We only have one life to live. And it’s up to each of us to create the life we want. That's been our Gastronomad philosophy for 12 years, and we're sticking to it! If you’d like to experience life in the land of Prosecco, the next Prosecco Experience will happen in May 2019. But space is limited so sign up soon! Earlier this year, our friend Claudio invited us to his winery's harvest party, which took place yesterday. So we made a point of being here in Italy for it in advance of our upcoming Prosecco Experience. 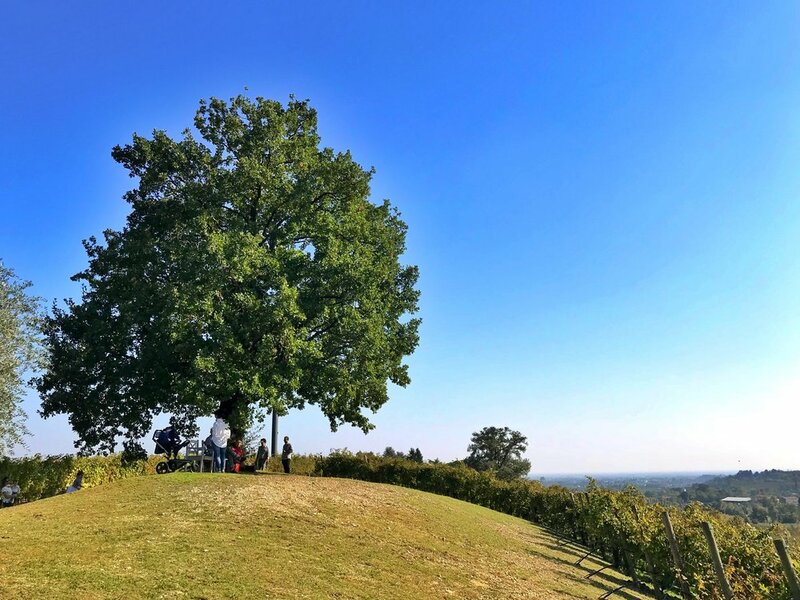 The winery is L'Antica Quercia, a shockingly beautiful organic winery and vineyards on the Prosecco Road in Conegliano between Venice and the Dolomites. Back then, Claudio and his winemaker Umberto told us about a wine he was working on -- a singular and pure prosecco. To oversimplify, sparkling wines are made more or less like still wines. But then they're made to sparkle with a secondary fermentation, which almost always involves the addition of yeast and sugar. For champagne and most sparkling wines, this carbonation takes place in the bottle. But for most proseccos, it happens in pressurized steel tanks. This new sparkling prosecco is unfiltered and unfined, and acquires its bubbles without the addition of yeast or sugar. Of course, carbonation requires yeast and sugar. But the yeast is from the vineyard and the sugar is from the grapes. Long story short: This kind of wine is very hard to make. And very risky for the winemaker. While we were standing there before dinner, Claudio showed us the brand-new labels for the new prosecco (the designers had brought it to the party). L'Antica Quercia labels form a Japanese-inspired inky “mural” when you line up the wine bottles in the right order. The winery is named after an old and perfect oak tree (the tree is highlighted in medieval church records). After dining with Umberto and his family and colleagues at the party, we were invited to try the new prosecco under the oak tree! The friendship, the scenery, the shade of that majestic oak tree -- and the prosecco! Wow. The wine is actually hard to describe, but it bears all the marks of its sublime origins and natural processes. This prosecco represents the rare ability of the winemaker to maximally insert himself into the process in order to maximally remove himself from the product and let you taste the work of the microbial world, the grape, the vineyard and the region. It was a magical moment, and we were filled with gratitude to have been able to enjoy the party, the meal, the incredible wine and, above all, the company of such wonderful, soulful and skillful people. Claudio told me that he might not actually sell this wine. But if he does, I'll be sure to post about it and tell you how to get some. And, of course, our Prosecco Experience gastronomads will be tasting this wine in a special and exclusive tasting with Claudio. I can’t wait for them to try it…. We define a "tourist" as a category of consumer -- a consumer of products and services aimed at holiday-makers on vacation. When you join one of our Gastronomad Experiences, you're a maker, a participant, a taster -- a food and culture explorer. You become a temporary local. Each day is filled with amazing experiences, and each experience is exclusive to us. These are not "services" provided for tourists. We have lived in each of the places where we have Experiences, and have spent years developing special relationships with local food visionaries, makers, artisans and others. We take you inside the culture, where you'll get to know these wonderful people, learn how to make the food and taste the very best of everything. "Planning an experience this exceptional by ourselves would be impossible without the years Mike and Amira have spent living in these locations and their dedication to making each event perfect." "The experiences that we lived were truly real and authentic." "It was clear that Amira and Mike had established a real relationship with everyone and every place we visited. We were welcomed and treated as if we were family." "Everything was expertly organized and of top notch quality." "A relaxing, casual, and friendly get-together with a small group of food and wine aficionados in one of the greatest gastronomic places in the world." 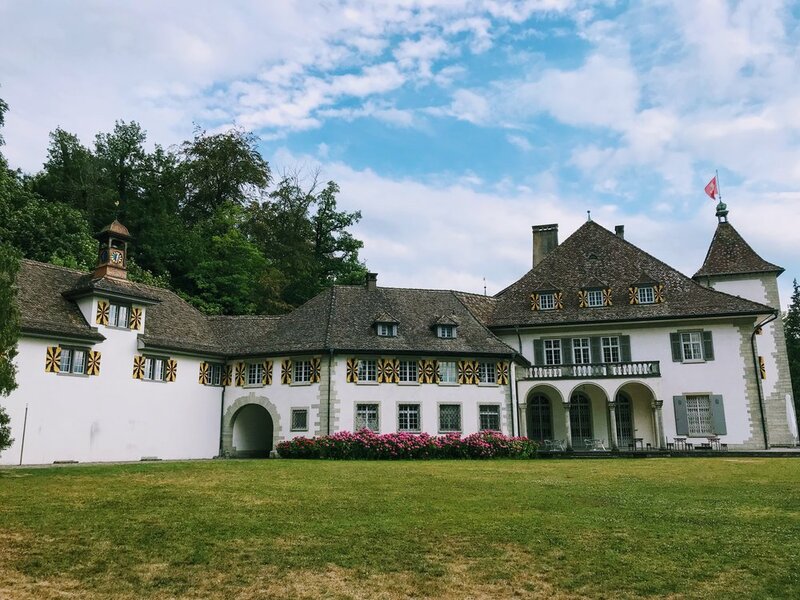 "Every day was filled with culinary activities and fascinating destinations where we learned about local specialties, ate fabulous meals and soaked in the beauty of the region." "Words can't express how amazing this experience was." "I would go anywhere with Mike and Amira!!" Our upcoming Prosecco Experience is sold out. But we still have spots open for our Mexico City Experience, Morocco Experience, Summer Prosecco Experience, Provence Experience and Cava Barcelona Experience. Don't try to change the world. Be changed by it! 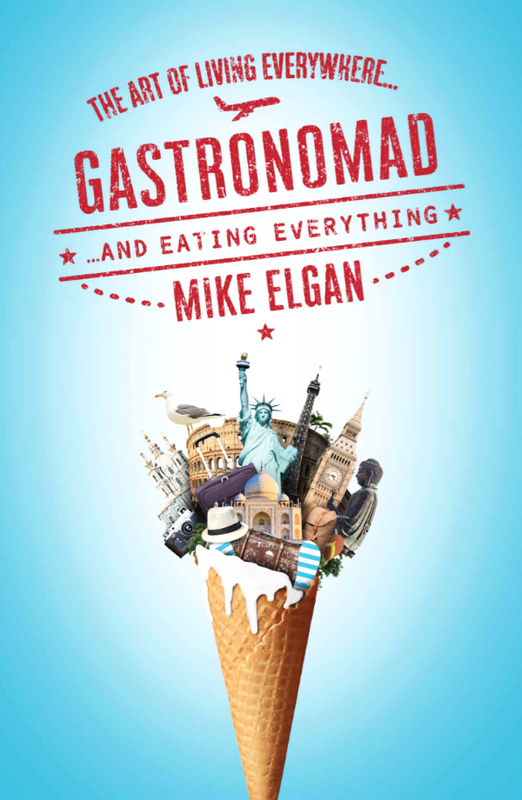 What does "Gastronomad" mean, anyway? A Gastronomad is a person who lives to explore. Our own Gastronomadic path began more than 12 years ago. Our whole family went "Mayan ruin hopping" in Central America, and we continued to work while traveling. In those 12 years, we've formed beatiful, lifelong friendships with wonderful people all over the world. We've seen amazing things, and tasted incredible food. 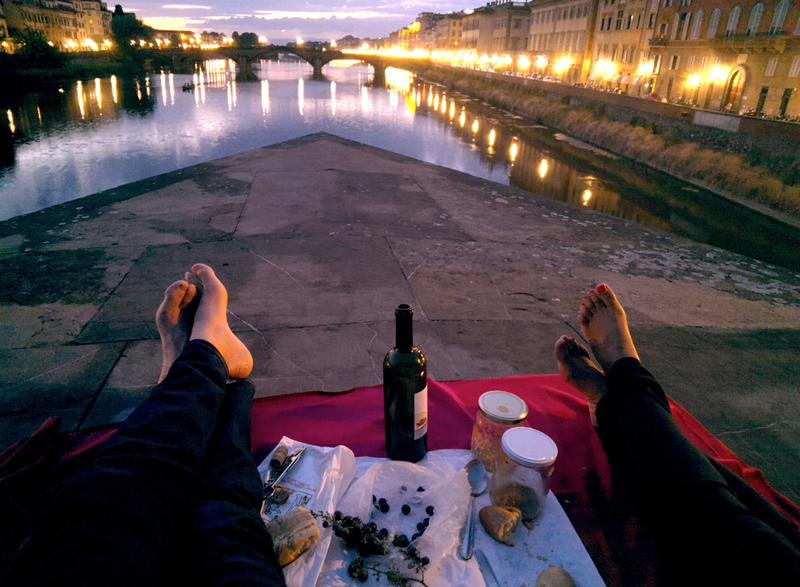 Most recently, we've started sharing our approach to living and traveling in the form of our Gastronomad Experiences, which are culturally authentic, food-obsessed travel adventures. As the first and only of its kind, The Gastronomad Experiences focus on the genuine exploration of a region’s culture through gastronomy and oenology in the world’s most beautiful places. When you join one of our Gastronomad Experiences, you'll go inside the local culture in a way that's impossible with tourism. We participate in authentic local traditions, create magical gatherings and explore incredible locations. You’ll be immersed in the way of life while learning from the local producers and makers, enjoying local delicacies and making friends with local food and wine visionaries. And the only way to be part of these adventures is to join us! Give yourself the gift of an unforgettable, once-in-a-lifetime exuberant, blissful, joyous and bubbly adventure! We travel not to change the world, but to be changed by it. You will never see food and wine the same way again. You will be delightfully transformed in wonderful ways you never imagined. Mexico City is already filling up! We’ll be going to Morocco, Italy, France and Spain in 2019! Tourism has a big problem. There's just way too much of it. I've seen it firsthand. And wrote about it here. The New York Times calls it "overtourism." Der Spiegel calls it "predatory modern tourism." The problem is that certain places become "famous" among visitors. They flock there in their millions. This drives up prices. In order to stay in business, shops and restaurants and other places must cater exclusively and expensively to the tourists, turning the original thing into a simulacrum of what made it famous in the first place. It also drives prices down, specifically the price of airfare and hotels, further encouraging ever larger numbers of people to flock to the well-traveled locations. Something like 670 million people "traveled" in Europe last year, a total that includes Europeans traveling domestically or elsewhere in Europe, and also foreign visitors from outside Europe. The trend is driven by other factors. Instagram is a constant, compelling advertisement for exotic locations. The rise of China and the increasing desire in that country for foreign travel is another. Overtourism ruins the places people love. And it ruins the experience of traveling. Airports are mobbed. AirBnBs are harder to book. Locals are driven out of their neighborhoods and cities because it's more lucrative to serve tourists than locals. Locals come to resent visitors, creating an feeling of hostility. Cities like Barcelona and Amsterdam respond by restricting services like AirBnB and Uber, making travel there deliberately more challenging. That's why the Gastronomad movement is redefining how travel happens. We invite you to join our Prosecco Experience to find out what this approach to travel is all about. Instead of a hotel, we'll all stay together in a beautifully restored traditional farmhouse with a view of vineyard-covered hills. After a delightful breakfast each day, we'll head out and explore the most delicious things the Prosecco Hills has to offer, plus one glorious day in Venice. During The Prosecco Experience, we'll meet the world's greatest makers of prosecco, as well as the winemakers who produce incredible red, white and orange wines in the region. The Prosecco Experience is about prosecco and the wines of the region. But it's also about all the things that go with prosecco: Otherworldly vistas, joyful gatherings, astonishing grappa and above all, the incredible, complex and subtle cuisine of Veneto. You'll not only enjoy this delicious cuisine at every meal, you'll learn how to make it yourself. The Prosecco Experience includes pasta-making class and other cooking classes. You'll learn how to make Italian cheese, artisanal bread. And more. Much more. We've even figured out how to visit Venice and avoid the tourists! Every day is packed with delightful surprises, sweeping landscapes and joyful gatherings with new friends. We hear this a lot. The problem with social media is that all you know is what you're presented. Do people with beautiful Instagram accounts really live beautiful lives? Or is it all "success theater" -- a mere performance? In our case, I can tell you that in fact the beauty is real. In fact, I'm often frustrated by the inability of our cameras to capture the true beauty of what we encounter in our travels. Also: I go extended periods of time when I don’t do any social media. Mike’s Dad died three weeks ago today and I was feeling too sad to share anything on social media except just a couple of posts about what we were going through. My feelings about social media are mixed. I object to the negative impact it has on our society in general and people in particular. I especially dislike and disapprove of Facebook and to some extent Instagram. Yet I still use them because they enable me to stay in touch with people I love. In particular, social media often evokes negative emotions and attitudes about self image. It instills unhealthy competitiveness and jealousy while inculcating egotism, narcissism and self-righteousness. This is particularly worrisome for what it does to the younger generations who don't remember a world without social media. I post on social media, usually Instagram, only when I have something personal to share and feel compelled to write what comes from my heart. Honesty, transparency and authenticity is something I strive for. And it’s my hope this is reflected not only on my day to day interactions in real life with people in general but also in what I share on social media in particular. I’ve struggled with social media the last few years because on the one hand, I don’t want to participate in a system designed by self-interested companies with self-serving agendas to manipulate people and how they feel while controlling what we see and what we don’t see in our streams. On the other hand, social media allows us to stay connected with our extended relatives, global community, and family of friends all over the world. It allows us to share what we’re up to and learn about and enjoy what others are doing. It’s also beneficial for our business as it provides a platform to promote our work and labors of love. So I decided to embrace social media and use it in accordance to my own values. Our social media posts and our pictures are real and they actually represent not a small but a significant part of our lives. It’s not social media "success theatre" -- it’s authentic slices of our life, which include the beautiful and the joyful as well as some of the sad and the painful. We suffer loss, we experience pain, and sometimes experience family discord like everyone else. And although we have our fair share of suffering in our lives, I can genuinely say, with great humility but unapologetically, that we do live a "charmed life," and we're grateful for it. And the charm in this life is by design -- we've worked hard to get it. And Mike tells everyone how to get it in his book. In fact, that's the sole point of the book. The joy, the happiness, the adventures around the world and the unforgettable, life-changing and exuberant Gastronomad Experiences are real. They represent our cumulative knowledge and lessons learned during our 32 years of travels and our nomadic living of 12 years. We Gastronomads live abroad for the food -- and everything that goes with it (the people, culture, the natural environment and human experiences of living). We go for the things we find. And we pay for it all by working using the tools we bring -- laptops, phones and all the rest. But there's one important tool we can't bring: Local internet connectivity. It's easy to find fast (or fast-enough) internet access in rich countries, where the cost of living is very high. But in developing nations, which tend to be more interesting and exotic, fast internet is much harder to come by. That's why it may surprise you to know that Madagascar has the fastest broadband internet speed in Africa -- comparable to the United States. In fact, Madagascar's 24.9 megabits per second average clocked speed is more than twice the global average. It's faster than the internet in Canada, France, and the UK! This may seem like a small consideration, but I can tell you it's not. Internet speed is the crucial and often missing factor while living and working abroad. Sadly, just 2.1% of the Madagascar population has access to this fast internet. It's a very poor country and has gotten poorer since independence from France in 1960. The country does have crime, but the crime rate is pretty low by African standards. The cost of living is very low. So it's a great place to save money for your growing business or for that next sojourn in Switzerland. Living in Madagascar as a temporary local can help the poverty in some small way because you're earning money from the United States and spend it in Madagascar. Beyond the well-known charms of Madagascar's flora and fauna, the country also has an amazing food culture. Great Idea! A (Removable) Suitcase Battery That Charges Itself! Smart luggage gets a bad rap because the TSA no longer allows batteries in checked luggage. A new crowdfunded bag called EBolt has a removable battery, so you can take it with you as carry-on. Then, you can use the battery just like any other pocket charger. But here's the best part. The company says its KineTech Wheel Technology charges the battery as you roll the luggage! The 5000 mAh battery is TSA compliant, as is the locking system. The bag also has an optional third wheel, so when you push the luggage instead of pulling it, all the weight is resting on the wheels. We’ve been enjoying our stay at our wonderful friend Miguel's home in Switzerland. 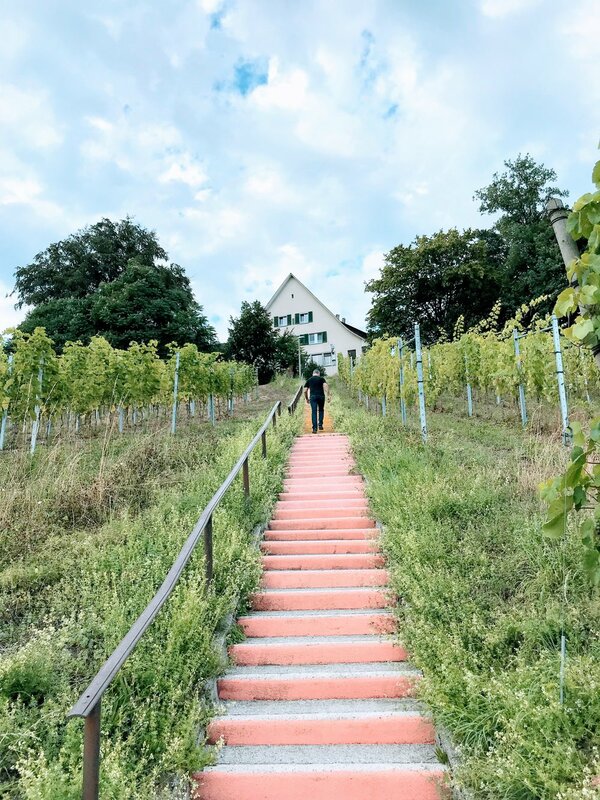 He and his awesome wife and kids live on the outskirts of Zürich — a 20 kilometer train ride from downtown and just a few steps from the lake. Their home location is idyllic!